Benjamin Graham’s famous quote on how to think about markets is so overused that it has almost become a cliché. Viewing at the market as a weighing machine is supposed to encourage us to ignore short term insanity of the type that has afflicted markets so far in 2016. However, appropriate humility requires us to take seriously the verdict of our peers, however seemingly misguided, when a series of “short runs” finally becomes the “long run”. Sometimes, whether by accident or insight, the “market” can turn out to be correct. Loews Corporation is one of those unfortunate companies that the market seems to rarely treat with much respect. Trading at a seemingly perennial discount to book value, Loews has often traded clearly below the sum of its identifiable constituent parts. Such a condition signals profound disrespect for the capital allocation skills of management. Like bees attracted to honey, value investors are always going to be tempted by these types of situations. 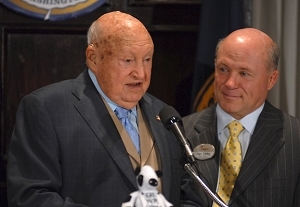 We first wrote about Loews in March 2012 and again in May 2013. This article briefly revisits Loews focusing on the relationship between the current stock price and the sum of the company’s identifiable parts. For background on the specific components that make up Loews, the reader should review the earlier articles along with the 2015 10-K report which was released yesterday. 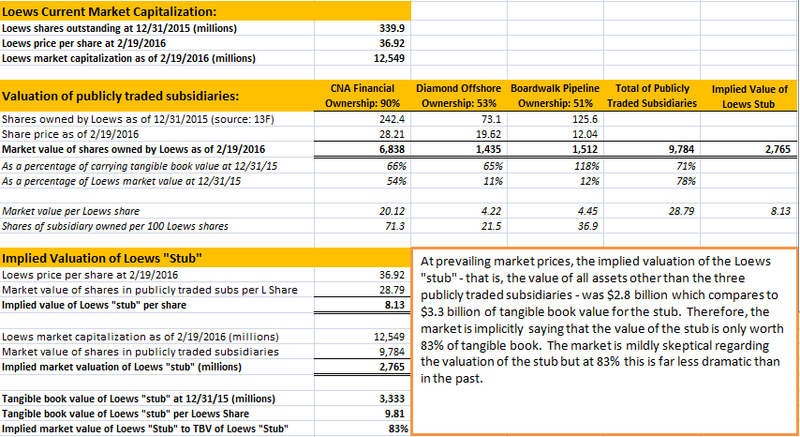 Loews lends itself to a sum-of-the-parts valuation model because the vast majority of its value is represented by its holdings in three publicly traded companies: CNA Financial, Diamond Offshore, and Boardwalk Pipeline. In addition to the three publicly traded holdings, Loews runs an investment portfolio at the corporate level, holds the general partner (GP) interest of Boardwalk Pipeline and operates a chain of hotels. By subtracting the market value of the three publicly traded holdings from the market capitalization of Loews itself, we can easily see what the market is saying about the value of the investment portfolio, Boardwalk GP interest and Loews Hotels which we refer to collectively as the “Loews stub”. There’s quite a bit of data in the exhibit to review. The first section simply presents a calculation of the current market capitalization of Loews by multiplying the shares outstanding as of December 31, 2015 by the latest market price. The market capitalization stands at $12,549 million. The second section looks at the valuation of the publicly traded subsidiaries controlled by Loews. The number of shares held were retrieved from the company’s recently filed 13-F report which lists positions owned as of December 31, 2015. We then multiply the number of shares by the latest market price for each of the three companies. The sum of the market value of the publicly traded subsidiaries stands at $9,784 million. The difference between the market capitalization of Loews and the value of the publicly traded subsidiaries is the implied value of the Loews stub which stands at $2,765 million. From the Consolidating Balance Sheet presentation in the Loews 10-K, we can calculate the tangible book value of the Loews stub to be $3,333 million. This means that the market is placing an implied value of $2,765 million on businesses and investments with tangible book of $3,333 million. This is a 17 percent discount which signals that the market is not placing much value on the capital allocation skills of management. While a 17 percent discount might seem significant, the Loews stub has traded at much lower implied valuations in the past. For example, using the same methodology, the market valued the stub at an amazing 84 percent discount in March 2012 and at a 64 percent discount in May 2013. The stock market is often wrong but when a condition persists for many years it is incumbent upon observers to consider whether the market’s assessment might have merit. To do this, we need to look at the performance of Loews in general over the past several years. To do a complete job of this assessment really requires a close look at the three publicly traded subsidiaries and isn’t something that will be covered in this article. However, in broad strokes, it is fair to say that CNA Financial has been the only relative bright spot in the Loews lineup of businesses in recent years. CNA has posted satisfactory combined ratios and has a good long term record of reserving. CNA itself is valued at a discount to book value by the market and may be undervalued. The other publicly traded subsidiaries have been hit by turmoil in markets driven by the price of oil and natural gas. Diamond Offshore’s business of leasing offshore oil drilling rigs has suffered greatly as low oil prices make drilling less attractive and Boardwalk Pipeline has followed the decline of the energy master limited partnership (MLP) sector. The decline in the share prices of these companies has directly impacted the share price of Loews. Perhaps a more important development impacting market confidence was the disposal of HighMount Exploration and Production. Although in retrospect it appears that Loews management was correct to sell this unit before the latest fall in oil prices, the market obviously viewed the associated write-downs as a poor reflection on the capital allocation skills of management. Despite repurchasing a large number of shares at discounts to book value in recent years (which is immediately accretive to book value), Loews has experienced sluggish book value growth. Book value stood at $51.67 per share on December 31, 2015 and has compounded at a rather anemic 3 percent rate over the past five years. Loews trades at only 71 percent of book value which reflects the market’s assessment of sluggish book value growth in the future. Arguably a firm heavily exposed to insurance that cannot grow book value beyond the low single digits does not deserve to trade at or above book value. Loews has a more impressive long run track record overseen by the same management that is currently in place. Aggressive repurchases could be the most intelligent use of capital at this point given the market’s gloomy assessment of the company. At some point, the energy markets will change and this will have a positive impact on Loews. However, it is not clear that any of the subsidiaries are natural long term “compounders” of the type one might identify with Berkshire Hathaway. Investors who purchase Loews shares at 71 percent of book value likely have substantial downside protection and could enjoy a one-time benefit from a share price recovery to near book value. However, in the long run, the return to Loews investors will gravitate toward the rate of book value growth. Long term prospects for attractive growth are murky at best. 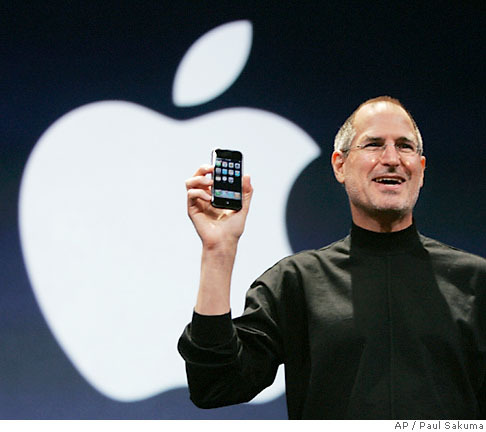 Does Steve Jobs Deserve Fortune’s “CEO of the Decade” Award?